French rivals Perpignan and Toulon are set to make history on Saturday when they go head-to-head for a place in the Heineken Cup semi-finals at the Olympic Stadium in Barcelona. The eagerly-awaited clash will be the first Heineken Cup fixture played in the football-mad city and will see Perpignan fulfil a long-held ambition to stage a tie in the heart of the Catalan region. Perpignan had hoped to host the tie at the city's iconic Nou Camp stadium but they should still receive vociferous support with the record attendance for a quarter-final set to tumble at their 55,000 capacity temporary home. Toulon confirmed their rising status within the European game as they emerged from a pool of big fish, which included two-time winners Munster as well as the Ospreys and London Irish. Perpignan's progress into the last eight was almost as impressive as they pushed two-time champions Leicester Tigers into second with their dramatic 22-22 draw at Welford Road, when Nicolas Laharrague slotted a last-minute penalty, a decisive result. Both sides ended with four wins in the pool stages and their domestic form has been equally comparable. They are seventh and eighth in the Top 14 with Toulon just two points ahead of their rivals after a 38-10 win over Stade Francais while Perpignan fell to a 25-24 defeat to leaders Toulouse in their last outing. Perpignan - Player to watch: Perpignan will be relying on their goal-kicking fullback Jerome Porical to match Jonny Wilkinson's accuracy in front of goal at the Olympic Stadium. 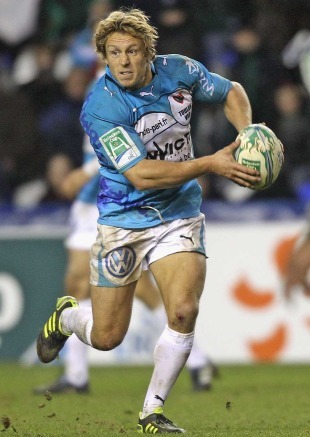 Perpignan - Team news: David Marty returns from suspension at outside centre where he will partner Jean Grandclaude. Fernand Cazenave is back in the No.9 shirt to partner Nicolas Laharrague while Jerome Schuster and Guillaume Vilaceca return at loose-head and lock respectively. Toulon - Player to watch: Fly-half Jonny Wilkinson is set make his first appearance in the Heineken Cup knock out stages and is sure to be central to his side's hopes. Toulon - Team news: Gabirieli Lovobalavu moves to the inside centre spot vacated by the cup-tied Gavin Henson with Geoffroy Messina coming in at No.13. Pierre Mignoni gets the nod to partner Wilkinson. Key Battle: Toulon's Joe van Niekerk and Perpignan's Henry Tuilagi are equally central to their sides' attacking game, despite their contrasting styles at No.8. While Perpignan will be wary of van Niekerk's break-away speed, Toulon will have to contend with muscular rumblings of Tuilagi. Trivia: Toulon reached the quarter-finals for the first time as they pushed Munster out of the last eight for their first time in 13 seasons. Prediction: Perpignan, roared on by an expectant, to overpower Toulon in an eye-catching encounter to match the occasion.